Now let’s look at pruning, Watson. This newly opened H.m ‘Ayesha’ bloom can be cut with a long stem and enjoyed in a bouquet. Note the curled petals that remind one of individual lilac blossomsGood idea, Holmes. That is a sticking point with many gardeners. The first couple of years, gardeners may have to be patient, Watson, especially if plants are small and location and soil are less than ideal. Give the plant a chance to settle in and get some muscle, eh Holmes? Quite right, quite right, Watson. Pruning should be limited to cutting dead twigs and old blooms, if there are any. Once plants reach a good size, gardeners should make it a habit to check them out at least once or twice a year. This sounds very complicated, Holmes. Not really, Watson. Shall we visit the garden on this fine summer day and look at some plants, maybe do some pruning? It’s still early in the season, so fresh blooms for bouquets can be cut with long stems. Later on, as new wood hardens and develops new buds, we should keep stems fairly short. We don’t want to remove new buds. I see some spent blooms on this bush, Holmes. Shall I remove them? If you wish, Watson. Cut down to the first set of leaves—that’s where the strongest buds are forming. Or, if you like, you can leave old blooms until next spring to keep the plant from looking like a bundle of sticks in winter. Old blooms may also help protect new buds. 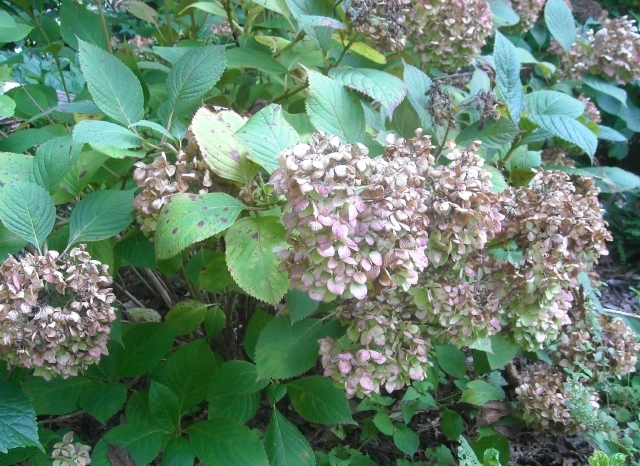 If we are not deadheading old blooms, we can wait until cold weather to check the hydrangeas again. . . .
Now that winter is upon us, Watson, and the plants have lost their leaves, we can see the form of the hydrangea more clearly. Let’s get our mackinaws on. Can you see the crowded stems and heavy wood on that older plant, Watson? The old woody stems should be cut to the ground to renew the plant and crowded stems should be removed. We can safely take out a third of the wood on this plant. 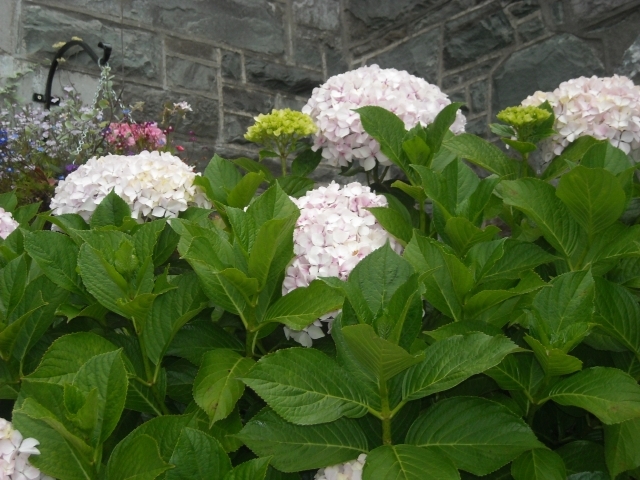 Look over here, Holmes, this hydrangea has outgrown its allotted space. It’s gotten too big for its britches. So it has, Watson. We can remove outer stems, or divide the plant. 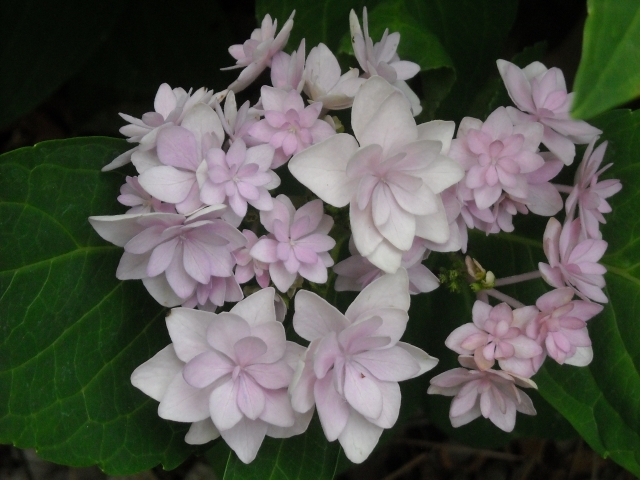 Yes, large old healthy hydrangeas can be divided by cutting down through the plant and carefully lifting a portion. 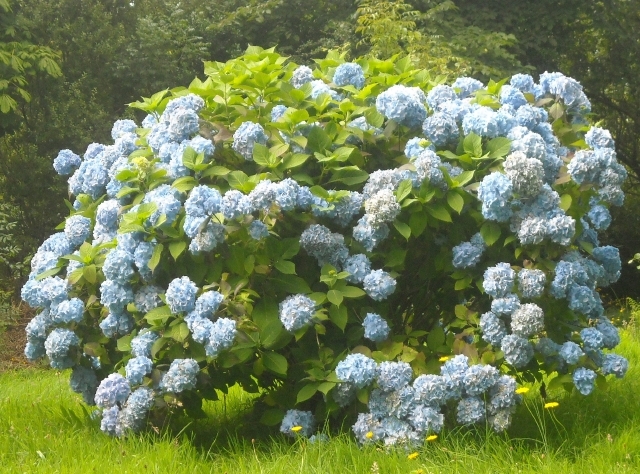 The main plant remains in place; it does not have to be dug or lifted. 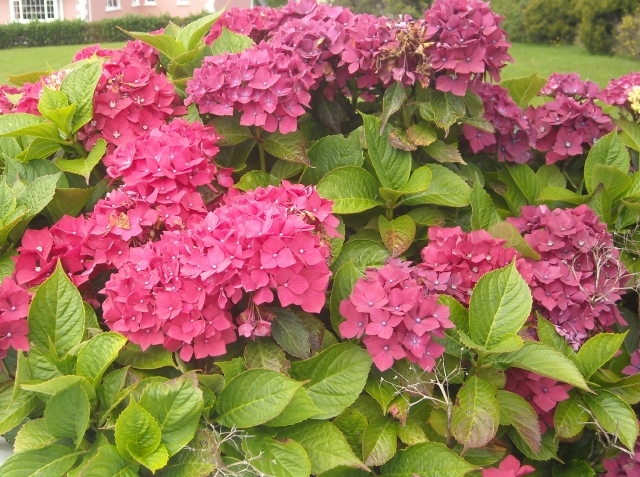 And what about this hydrangea here? Much too tall for the garden. Yes, Watson, I agree. We can begin to maintain height by cutting out about a third of the tall stems at the base each year, a scraggly business. For quicker results, we can cut the entire plant down to the height we want, or a little lower. We may sacrifice next year’s blossoms unless buds lower on the stem produce blooms. Perhaps a little extra fertilizer in the spring would help, eh Holmes? Yes, but too much nitrogen can sacrifice chances of bloom in favor of heavy leaf growth. Chilly out here, isn’t it? We can wait until spring to do a final pruning. . . .
Holmes, the weather’s finally warming up after all these frosts we’ve had and it looks like the hydrangea buds are beginning to break. Right you are, Watson, let’s get out there and, at the very least, tidy up the plants by deadheading old blooms. 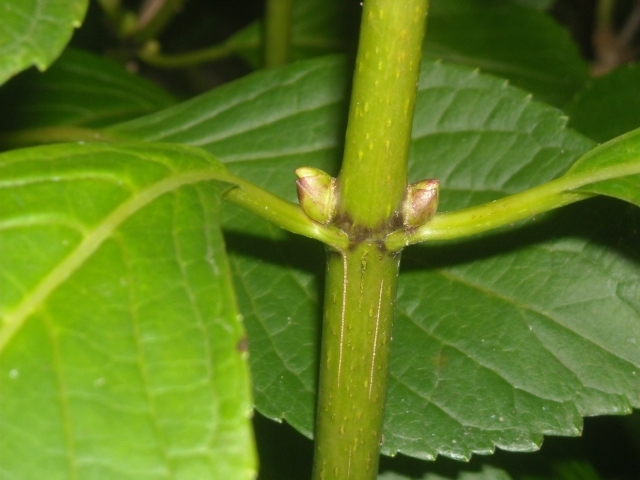 Then we can examine each stem to find the topmost living bud. We have several plants to look at and prune, so this will take us some time. This has been a hard winter with little snow cover, Holmes, with some late spring freezes after buds have thrown off their tough outer cloaks. I’m afraid we’ve got some damaged buds. Yes, Watson these late spring frosts can kill the buds we’ve counted on for summer bloom. We’ll have to cut stems down to the first green buds we see. Don’t despair. 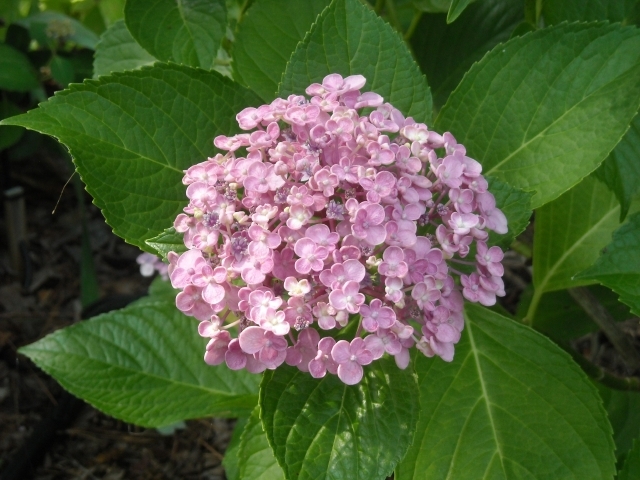 If our plants are strong, healthy buds lower down on the old stems may develop into blooming stems. 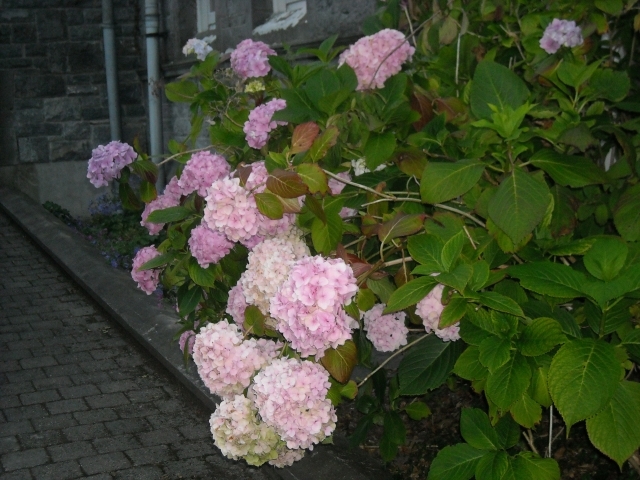 Aha, that’s why the Endless Summer series of hydrangeas is such a gift to gardeners in the north. They will survive cold, snowy, or snowless winters and bloom because they can produce flowers on new stems of the year. That’s right, Watson. They don’t depend on buds formed the previous summer. Come look at this hydrangea, Holmes. It’s a mass of dead twigs. Hmm-m, it looks like it’s still alive, but any growth will have to come from the base of the plant. You know, Holmes, with all the deer damage we’ve had in the garden, I think I will leave the dead twigs on the plant—might stop the deer a bit. I know I wouldn’t like to get poked in the nose while I am eating dessert. You know, Holmes, pruning, mulching and watering are good ways for gardeners to keep in touch with their plants each season. Thin old plants in winter. Deadhead old blooms and check on flower buds in spring. Mulch in early summer or late fall, depending on your location. Water on summer days if necessary. And enjoy cut flowers, too. Quite right, Watson. 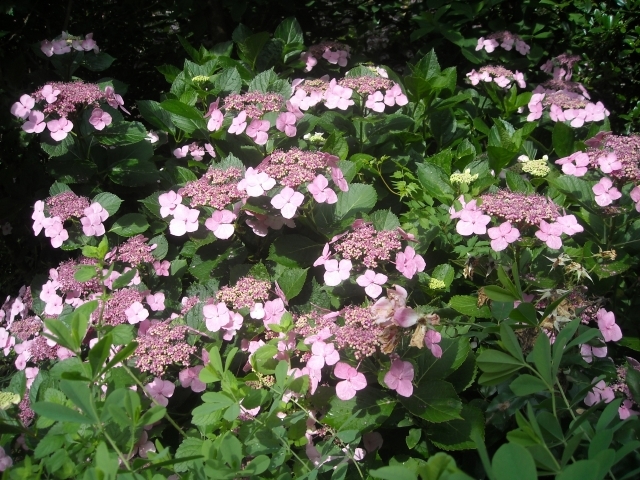 Except for springtime pruning, it doesn’t take a whole lot of time to keep a hydrangea comfortable. And if the weather cooperates and your hydrangeas are doing well, you can sometimes skip the work and go directly to the pleasure.